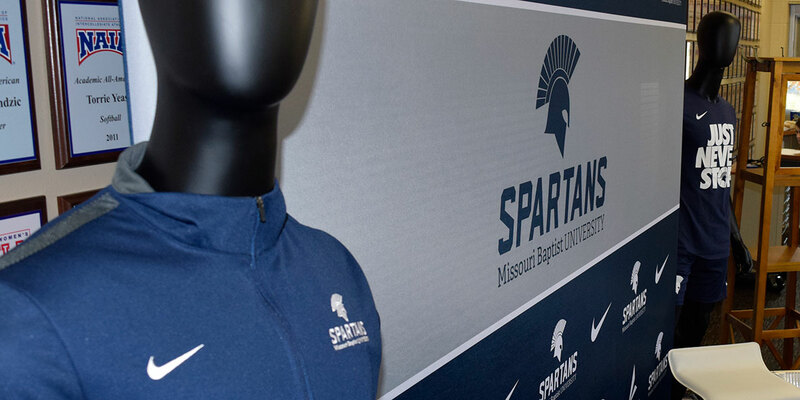 The Nike swoosh logo can now be seen on all Spartan apparel as the Missouri Baptist University athletic department has struck a five-year deal with the brand and BSN Sports. The partnership was made possible thanks to the collaboration of MBU Athletic Director Dr. Thomas Smith and BSN, a factory-direct sports equipment company based in Farmers Branch, Texas. With the Nike swoosh being slapped onto every athletic uniform at MBU, Smith said he looks for it to draw in more potential future Spartans. “As far as the Nike product, it is something that is very beneficial to us as a recruiting tool and is saving us money in terms of our overall apparel purchasing for the athletic department,” Smith said. Smith said he also thinks partnering with Nike and BSN gives MBU a more authentic outlook. Spartan football coach Jason Burianek said his players are all for the contract. “The guys like Nike better, which sweetens the deal,” Burianek said. MBU baseball coach Eddie Uschold declined to comment on the new deal. Before joining the Nike brand, MBU’s individual athletic teams chose which apparel they wanted to wear, whether it be Adidas or Under Armour. While Nike has faced controversy for naming former NFL quarterback Colin Kaepernick as the face of their 30th year anniversary advertising campaign, Smith said he wants MBU to have nothing to do with what’s going on there. Kaepernick, former San Francisco 49ers quarterback, first kneeled during the National Anthem in protest for black lives and against police brutality back in a 2016 preseason game against the Green Bay Packers. Two years later, in 2018, an unemployed Kaepernick has stood strong in his protest, sacrificing his position in the NFL. However, Nike picked him as the face for its current ad campaign. Many Nike fans initially protested the ad campaign by burning their Nike gear and refusing to buy any of the company’s products in the future. Nike’s stock value initially tumbled more than 3 percent after the ad was introduced, but sales rebounded and in September the company showed a 31 percent increase in sales since releasing the Kaepernick ad. According to Smith, whichever time the ad campaign came out wouldn’t have any effect on MBU’s deal with Nike. College of the Ozarks, a small private NAIA Christian school in Point Lookout, Missouri, was one of the first schools to end its deal with Nike. The school also re-evaluated its contracts regarding competition, adding all players and coaches must respect the American flag and National Anthem. MBU’s partnership went into effect on July 1, 2018, two months before the ad campaign took place. Despite the controversy, Smith said he believes MBU is ahead of other institutions due to the new contract. “I think it puts us in a whole different league compared to most NAIA schools,” Smith said. ♦ Nike was founded by Bill Bowerman and Phil Knight in January 1964 as Blue Ribbon Sports; They officially became Nike Inc. on May 30, 1971. ♦ Based near Beaverton, Oregon, the company is now worth approximately $30 billion. ♦ The company takes its name from Nike, the Greek goddess of victory. ♦ Since the beginning, the company has targeted athletes as its main audience. ♦ Nike has partnered with some of the greatest athletes to be the face of their advertising campaigns, including Michael Jordan, Serena Williams and Tiger Woods. ♦ Nike’s swoosh logo is one of the most recognizable logos in the world.